There are many great options available under $500. As a matter of fact, for the regular consumer, hobbyist, or entry-level 360 camera user, the best and most valuable options seem to land in the $300 range. In my opinion, this list gives the consumer a comprehensive view of the options available to them. I think that these options all have their own merits; none of them are perfect, but they will each suit a certain type of person better than another. 2 Should you even invest in a 360 camera? Should you even invest in a 360 camera? Today, we live in a world where Virtual Reality, especially with the recent advances in ray tracing (by Imagination Technologies), which once seemed like a sort of distant pipe dream, continues to grow closer to becoming an element of our everyday digital media culture. With this advancement in technology, more products which embrace this change are becoming available to the public. They are often used for panoramic photography and robotics. Many photographers, filmmakers, and videographers have expressed significant interest in making content which features 360 degree views and potential to engage with elements of Virtual Reality to create cutting-edge, dynamic environments. For the average consumer, a 360 degree camera offers an unbelievably effective method of capturing memories in a more detailed and vivid sense than any photograph ever could! Many who enjoy adventures in the outdoors and other sorts of travels have began using 360 camera technology to make enriched documentation of their journeys. There are two versions of this attachable 360 camera, one for your iOS device and one for your Android. This device live-streams to youtube, facebook, and periscope, and the experience is made easy and accessible through the Giroptic iO 360 app, which is a fantastic app, by the way. This is an easy, plug and play device– no Bluetooth or wifi are required to connect to the phone. The camera has its own internal battery, too, which is fantastic. In other phones, the camera drains battery-life quite fast, so this is a major positive. The app is well-designed and easy to operate. No SD card is required, as the content your record will make its way directly to your phone. The downside of the separate battery is that you have to charge the camera battery separately. The photo quality is not the best, but it is not the worst either. Also, the camera plugs directly into the USB port, which means that the device must be held upside down when using the camera. Up until the release of the Giroptic IO, Ricoh Theta S could very well deliver the best value for your dollar out of any 360 camera on the list. This camera has an impressive still resolution of 14 MP, and also delivers with fantastic, full HD, 360 degree spherical video, which is supported by Youtube and comes through at 30fps. The videos and photos you take on your Theta S can be transferred directly to your mobile device, too. Typically available for $300-$350, this is perfect for consumers, hobbyists, and professionals who are making their first foray into the world of VR. This High Resolution option by Samsung is lightweight, durable, and offers an alternate operating option which allows you to catch 180-degree video with its wide-angle lens. Geared toward Samung using consumers, Samsung’s Gear 360 creates an experience that is easy to interact with, the interface simplifies the process of shooting, editing, and sharing your experiences. Videos can be instantly shared on Youtube, Facebook, and Samsung VR. The 25.9 MP photos make this a standout option, and the video is captured in a vivid 3840 x 1920 resolution. It is also waterproof; not to be submerged, but it can certainly withstand the wind and the rain. Also available for $300-350, this delivers a lot of value if you are looking for resolution that is among the best. Nikon takes their attempt at a 360 device with their KeyMission. This is shockproof, freezeproof and waterproof device that comes equipped with WiFi and Bluetooth. The resolution is certainly impressive, as this camera boasts 4K Ultra HD video and shoots still photographs at 23.9 megapixels. It is lightweight and wearable, and perfectly suited for the outdoor adventurer. Bearing some impressive features, this $500 option is good, but not quite as cost-efficient as its competitors. There are less expensive options that deliver better results; shareability, desktop software, and general performance should all be improved in Nikon’s future attempts. Another big name from the world of photography, Kodak has created a unique and interesting 360 device. Unlike Nikon, Kodak’s device is very affordable, priced at roughly $230. It is easy to use, and the video comes in at a very high resolution of 1080p, and also 10fps. For still images, the camera features a 16mp sensor. Shockproof, freezeproof, dustproof, and splash resistant, this is a durable camera. The SP360 can also connect to wifi, as well as your Android or iOS device. Kodak has also designed stitching software to stitch footage from two different SP360’s together! Unfortunately for those looking to utilize their camera for Virtual Reality, it isn’t spherical, so you don’t get to view the whole 360 degree at any given time. Creates great fisheye and panoramic shots, but doesn’t give the desired experience of a 360 camera. This is a totally affordable, unique, and inventive idea. The Insta 360 Nano is compatible with iPhones 6, 6S, 7, and 7 plus, and can also be used alone. At 3040 x 1520, The resolution is incredible, and the 30fps is nothing to frown at, either. The camera captures images with a dual fisheye lens system, and the device is extremely portable. It is also compatible with Facebook and WeChat to stream live 360 video in real time. The VR Cardboard box app makes this a fine option for those looking to engage with Virtual Reality through the content they create. This spherical video camera combines cutting edge portability with a wide range of high end functions, and it is only $200. It also comes equipped with a MicroSD with 64GB of space. This option delivers amazing value and is definitely a solid choice! This camera was one of the landmarks of 360 video technology, and its existence represents that milestone in the culture of photography; but it is still a pretty good camera, too. The resolution is quite good, with a 1504 x 1504 video resolution. 360 fly offers apps for iOS and Apple, as well as desktop options to simplify the process of using, editing, and sharing the footage that it captures for you. This is a camera that makes Virtual Reality footage as easy as the push of a button. It is also water resistant and it is priced very well, available for as low as $199.99. It also features 32 GB of storage space, — unfortunately, the maximum download size for a single video is 2GB, and the video will stop recording abruptly if you hit that mark. This spherical video camera combines cutting edge portability with a wide range of high end functions, and it is only $200. It also comes equipped with a MicroSD with 64GB of space. This option delivers amazing value and is definitely a solid choice! This 4K rendition is very similar to the normal version of the 360fly, but with a few boosted features. Equipped with a 16 megapixel image sensor, the video resolution is nearly doubled (2800 x 2800). The price, too, is basically doubled, as this camera costs roughly $400-500. Speaking of doubled, the camera also has 64 GB of storage space. Extra features include the ability to add data to videos, e-compass, gyroscope, and non-assisted GPS. This 360 camera is about as affordable as a quality device can be! This spherical camera uses two 13 MB sensors and two 200-degree wide-angle lenses. It shoots full 360-degree video with 2K resolution. It is compatible with Youtube and Google Street View for immediate uploads, and contains 4GB of memory. The image stitching is quite clean. Coming it at just under $100, I think that it is safe to say that this is the best option under $200! By no means is this the most amazing option for a 360 camera, but it is generally quite impressive and effective for the price you pay; the bang for your buck is notably high. Meanwhile, as WordPress, Facebook, and Youtube continue to become increasingly friendly to the idea of 360-degree content, a significant supply is being created to match the demand. At the moment, there is a wealth of quality 360-degree cameras available at a wide array of costs– ranging from about $100-$60,000. 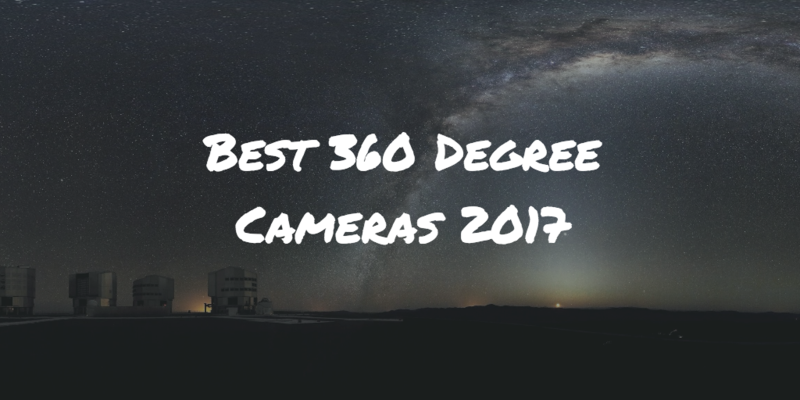 Some of these manufacturers specialize in 360 cameras, whereas other brands such as Kodak and Nikon have also joined the race to create the best and most successful 360 camera. Although it cannot be denied that cameras on the “$60,000” end of the spectrum will provide you with a very good method of capturing amazing images and creating Virtual Reality content, this price tag is certainly unnecessary if you are looking to engage with this new movement in photography. There are fantastic 360 degree devices currently available on the market for impressively affordable prices. Still, not all products are created equal (for better and for worse), and there are also a lot of cameras that do not deliver value in the way that many of their competitors do. Here, I’ve compiled a list of some of the most efficient and effective devices that should be considered by any potential purchaser of a 360 degree camera.